When we picked up the keys to our Seat Ibiza six months ago, we had just crowned it the best supermini on the market. So the question we set out to answer was simple: would we still consider it the class leader after spending an extended period with it? Now, I could try to build up the tension by waiting until the closing paragraphs to tell you. But given how quickly the outcome will become apparent, let’s answer that right here: yes. Yes, it does. Very much yes. Have I given that away too quickly? Well, maybe. But it doesn’t feel like it: in reality, I knew that would be the answer barely a few weeks into my time with the Ibiza. At a time when I’d still be settling in to most cars – fiddling with the seat adjustments, trying to remember where all the controls are, that sort of thing – I felt utterly comfortable and at home in the Ibiza, as if I’d been driving it for years. Now, those of you with long memories may recall me mentioning that I had previously driven an Ibiza for years – 12 of them, to be precise, having owned a 2005 model from new until selling it last year. But don’t think my feeling of familiarity was because of that: the newest Ibiza is an entirely different beast from its predecessors – more refined, more rounded, more complete, more, well, more. Given Seat’s place as the VW Group’s youth-orientated brand, I was expecting that my assessment of the new Ibiza would involve channelling my 26-year-old self. But the new Ibiza has arguably grown and developed more in the intervening 12 years than I have. Of course, the price has grown, too, and at £17,510, our Ibiza 1.0 95PS FR isn’t exactly a budget offering, although it’s still slightly cheaper than the equivalent Ford Fiesta and Volkswagen Polo. As a result, buyers are going to be less accepting of the compromises that buying a smaller, cheaper car usually involves – and that’s where the Ibiza really scores. It is good to outstanding in every area that matters for a small car.Around town, it cruises happily. Sure, the three-cylinder engine can be ever-so-slightly thrummy at low speeds, but that quickly eases into smooth, quiet running. And on quicker roads, the Ibiza breezes along. Even at motorway speed, that 1.0-litre engine always has a ready supply of power and torque if and when you need it. It was pleasantly economical, too. I normally got mid- 40-miles to the gallon and averaged 51.4mpg on one particularly long motorway trip. 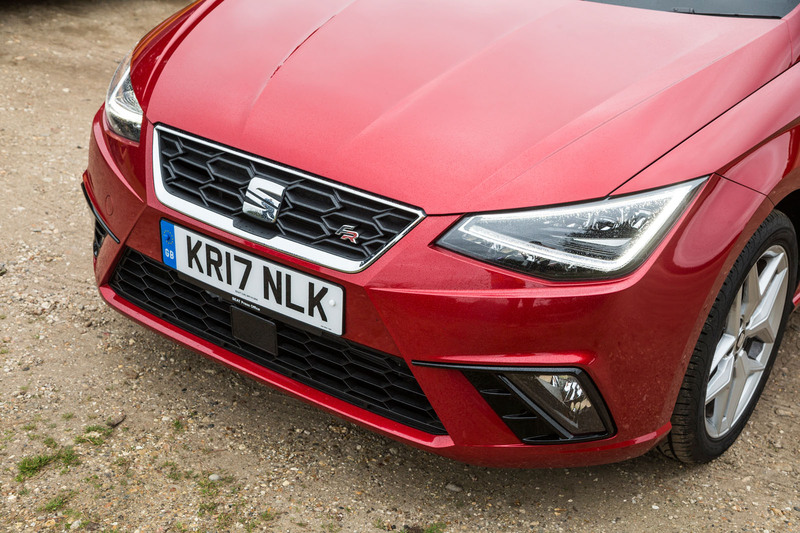 On flowing country roads, it’s very composed as well, although don’t be tricked into thinking that Seat’s ‘youth’ focus means the Ibiza is honed for sporty handling. It can be fun, sure, but this Ibiza displays a maturity and poise, an all-round relaxed demeanour, that allows it to hold its head high against its rivals. For a small car, space was rarely an issue, either. Passengers were always comfortable in the back, and when I needed to cram in lots of luggage, the Ibiza proved adept at swallowing far more than you might expect. I was a big fan of the interior, too. It was comfortable and stylish, without being overly showy. And, sure, the Ibiza might have a relatively basic version of the VW Group infotainment system (no fancy high- resolution Google Map images or digital dashboard here), but I found it easier to use and more rounded than some of the posher versions I’ve tried. I quite like having a proper dial to change the volume on the radio, for example. If I had any gripe with the system, it was the occasional hassle of getting my iPhone to connect via Apple CarPlay – but such issues seem to be more generally to do with Apple’s system (having experienced similar in other cars) than the Ibiza’s. So did I find any major flaws after six months in the Ibiza? Frankly, after searching with increasing ferocity, the Ibiza’s list of failings remains stubbornly short and trivial. The biggest is probably that, dueto the car’s stylised bodywork and sculpted wing mirrors, rear visibility isn’t the best. The issue is exacerbated by the strange omission on our upmarket FR-trim model of rear parking sensors (a £220 option) or a reversing camera (part of the £425 Vision Plus Pack). Sure, it’s easily solved by ticking an option box (and shelling out a little more cash) but it seems odd not to include a reversing aid in the first place. What else? Well, the sharply styled bodywork meant dirt collected on small areas of the car after long motorway journeys on murky days. The boot occasionally didn’t shut properly when I closed it (although that could be because I wasn’t giving it enough force). And the passenger door handle was a little sticky, on occasion. And... well, that’s about it. Hardly an incriminating list, is it? The supermini class is ultra- competitive, and both the Fiesta and Polo can put forward compelling cases. The margins between them are small indeed. But, to me, the Ibiza’s all-round excellence makes it a truly strong contender – yet it retains a distinct, fun character (something our testers struggled to find in the Polo during its recent road test). STRONG ENGINE: Quiet, frugal and never lacking for power: this three-pot is everything you need for a car of this size. SHARP STYLING: Yes, you can spot the VW Group supermini heritage but the Ibiza’s sculpted bodywork helps it stand out. BEATS SOUND SYSTEM: Younger members of our team raved about the audio quality of the Beats stereo (a £365 option). NO REVERSING CAMERA: It has a lovely infotainment screen, which highlights the oddity of not fitting a rear camera as standard. LOW-SPEED VIBRATIONS: The engine is a little clunky at low speeds, although it makes up for that in all other aspects. Forget your Cupra-badged performance rockets: for me, the Seat brand is defined by peppy, fun, small hatches such as our Ibiza FR. As James attests, its charm lies in its broad- batted accessibility, but no aspect of the Ibiza feels like a compromise. That’s VW Group polish for you. Our Ibiza has the upgraded Beats Audio system – a £365 option – which comprises a 300W amplifier, six speakers and a ‘high-end’ subwoofer in the boot. Beats, founded by rapper Dr Dre and owned by Apple, has a huge market share in high-end headphones, and if they’re anything like as clear-cut as the Ibiza’s sound, it’s clear why. The new Ibiza sports some stylish design and lines, but a series of journeys on murky winter roads have revealed a mucky by-product of that sculpting: grime builds up on a few small areas of the bodywork. The shut line just below the rear door passenger handle gets dirty particularly fast, presumably where all those aero lines push the dirt. It’s easily solved by a good car wash. Finally. I’d finally caught it out. As the revs dropped and my momentum began to wane, I thought I’d found the Seat Ibiza wanting. After a few thousand miles of motoring on every type of road, I’d failed to find a situation in which the Seat Ibiza’s engine didn’t exceed any expectations you could fairly place on a 94bhp 1.0-litre three-pot. Until now. Because, on a fiendishly steep hill just a few hundred metres from my family home in Clevedon, I finally found myself asking for power that the engine was unable to deliver. First, some explanation. Clevedon, a picturesque Somerset seaside town (fact: Clevedon Pier is a two-time winner of the National Piers Society Pier of the Year Award), is built around a number of hills. My mum still lives in the house I grew up in, which is near the top of the biggest of the lot, Dial Hill. (Ask picture editor Ben Summerell-Youde, another ex-Clevedon resident whose family grew up at the bottom of the hill, and he’ll incorrectly tell you that makes me posh.) The most direct road up to my mum’s house is Park Road, a steep and narrow road hemmed in by thick walls. I approach it via a sharp, blind right-hand turn at a crossroads, making it hard to hit the climb with any momentum. Given the propensity for wall-fearing drivers coming down the hill in the middle of the road, my tactic is to take a wide line as I turn and get up to second gear on the flat, in preference to spending 30 seconds or so chugging up the hill with the engine screaming in first. It’s a tactic that’s worked in every car I’d ever driven up there, with the exception of the 1.0-litre BSM Vauxhall Corsa I learned to drive in far too many years ago. But as I found myself with foot flat to the floor and the revs dropping precipitously, it seemed the Ibiza might just fail the challenge. As reached for the gearstick to change down to first, though, the Ibiza’s engine picked up steam and powered up the Park Road hill with a vigour to shame many bigger-engined cars I’ve driven up there. Instead of finally finding its limit, I found myself again revelling in how impressive the engine is. Plenty of miles to, from and around Somerset over the Christmas period offered abundant proof of just how easy the Ibiza is to live with. A few weeks ago, Mark Tisshaw was bemoaning that his Volkswagen Golf GTI long-termer had a lovely 9.2in touchscreen but no volume dial. Well, the Ibiza’s infotainment system might ‘only’ feature an 8in screen but it has a volume knob. It’s a great example that Seat’s relative lack of grandeur compared to other VW Group brands serves it well. I don’t mind that the infotainment system isn’t the fanciest in the VW Group, because it’s simple and functional; like the finest bear-honed porridge serving, it’s just right. For my post-Christmas return to London, the Ibiza was put to another tough test, laden with my belongings and presents (fact: pasta makers are heavy and bulky), along with my mum (who isn’t, but was en route to Heathrow for a trip to visit family in Texas and thus carrying plenty of luggage). There was enough stuff to fill both the Ibiza’s boot and rear seats yet it was with some amazement that I managed to do so without even needing to fold down the rear bench. And at no point on the journey back towards London did the Ibiza’s engine show any strain at the extra weight it was carrying. I didn’t get a Super NES Classic for Christmas, but I’ve been getting my gaming fix from Seat’s EcoTrainer function. To score highly, you have to keep the Ibiza image in the blue box in the middle of the touchscreen, achieved by avoiding heavy braking and acceleration. The boost to my fuel economy is helping me save for a SNES (if I can find one in stock). The winter weather has revealed a neat touch the Seat Ibiza shares with the 2005-spec version I previously owned: a snowflake that appears on the driver information display when the outside temperature drops below 4deg C.
After a recent holiday to Texas, spent driving a typically anodyne hire car, I was excited to regain the keys to our Seat Ibiza. Before even reaching the exit of the Autocar Towers car park, I had regained the warm glow of contentment I’ve felt whenever I’ve been driving it. If anything, being reunited with the Ibiza after a break has made me appreciate it even more. This struck me a few days after returning from Texas, when I forced myself out of bed before dawn on a chilly Sunday morning to take part in a 10k run in Wiltshire. After breezing through the quiet streets of south-west London, I was zipping down the M3 when I realised something about the Ibiza: in terms of driving, it just does everything well. Really well. So far, I’ve subjected the Ibiza to my stop-start commute through Greater London traffic. I’ve taken it on motorways and A-roads, used it as an airport shuttle, and packed the boot with cases and shopping. I’ve driven it on some lovely, flowing country roads too. And I’ve yet to find a situation in which it doesn’t excel. I noted in my first report how impressed I was with the one-litre engine in our FR-spec Ibiza, and that appreciation has grown as well. It’s remarkably at home on a motorway, never feeling stressed even after long periods at 70mph or so. It’s also incredibly good to drive: nimble and light, yet always sure-footed. It doesn’t feel as twitchy as some small cars, and is always able to respond assuredly if you ask it to display some enthusiasm. In my view, the Ibiza scores because it does everything so well but doesn’t really shout about it. The nearest I can come to finding fault with its performance or dynamics is that the first gear pushes the car forward a little too fast to be able to let it roll along in stop-start London traffic, but that’s hardly the car’s fault. Which made me suspicious about my Sunday morning M3 musings: is the Ibiza really that good, that grown-up, that eminently capable? Or has my thinking just been coloured after hire-car tedium? Fortunately, executive editor Matt Burt had also signed up for the 10k and spent time driving the car when I was away. So I asked him to describe it. ‘Easy’ might sound like damning with faint praise, but it’s really not. It’s a sign that perhaps the most impressive thing about the Ibiza’s drive is that it’s hard to think of anything it does badly. A recent 600-mile round trip to Kirkby Lonsdale in Cumbria proved a real test of the Ibiza’s comfort levels, but I reached the edge of the Yorkshire Dales without any of the aches and pains you might expect from a long haul in a small car. Even better: I arrived with more fuel left than I expected, having averaged 51.4mpg on the motorways. When we added the new fifth-generation Seat Ibiza to our long-term test fleet, I was the natural choice to run it. Why? Because I’ve spent plenty of time driving one. A six-month stint in a new Ibiza FR barely qualifies as a long-term test compared with the 12 years that I owned a third-generation, 2005-vintage 1.4L Sport. I bought my Ibiza from new and only parted with it earlier this year. It proved a trusty companion, only really letting me down once – albeit in spectacular fashion when an engine problem caused me to grind to a halt on the M4 with my sister-in-law and five-month-old nephew on board (I think she has since forgiven me…). Don’t think my positive feelings towards my Ibiza might cloud my objective judgment, either. If anything, I grew intimately aware of my Ibiza’s many faults and foibles. Those ranged from the major, such as suspension a little too firm for London’s pot-holed streets and a 1.4L engine that didn’t quite have enough torque at low speed, to the more trivial, such as the slightly questionable quality of certain trim bits, lack of any form of boot light and woeful slide-out cup holder. Believe me, I know where to look to find faults with an Ibiza. I could forgive some of those faults because, in 2005, Seat was something of a budget brand, offering a relatively affordable way to buy a Volkswagen Group machine for those who couldn’t stretch to a VW and wanted something with sportier styling than Skoda. Now? Our Seat Ibiza FR costs £17,510, which puts it into the same price bracket as the new Polo it shares a platform with and the Ford Fiesta. Expectations have duly shifted up a few notches. Those expectations have been heightened further by our road testers, who proclaimed the new model the best small car on the market today. Or put another way: a Ford Fiesta beater. Now that’s pressure – and our goal is to find out whether that verdict holds after an extended time in the car. The Ibiza’s 4.5-star road test verdict made choosing a spec for our long-termer easy: we asked for it as our testers assessed it. Which means we’ve chosen the 1.0L three-cylinder TSI 94bhp engine, driven through a five-speed manual ’box. In this spec, our car can do 0-62mph in 10.9sec, with a top speed of 113mph, and I’ve been largely achieving solid mid-40s mpg fuel economy. Initial impressions are remarkably positive: it’s quiet at low speeds yet develops a nicer sound when pushed, and I’ve yet to find it really lacking power. Aside from an occasional thrum when accelerating in lower gears, it’s smooth and responsive too. It’s hard to think why you’d really need a bigger engine (except in a Cupra version, obviously; just saying, Seat). We opted for the slightly upmarket FR trim, which comes with pleasant Nora Black FR cloth seats and a clean, clear dash. You can definitely see the family resemblance to my old Ibiza’s interior, but everything is more grown-up and refined. A huge part of that is the full-colour infotainment touchscreen, which features Seat’s version of the VW Group’s excellent system, including features such as Apple CarPlay connectivity. Grown-up also describes the exterior of the Ibiza, and not just in terms of design, although Seat’s Leon-inspired angular lines and stylised creases certainly exude sophistication (the previous Ibiza looked like a squished Leon; to me, this new design just looks nicer than the Leon). To complete the look, we added metallic Desire red paint and the full LED headlights. But it’s literally grown-up because, like many of its small-car rivals such as the Fiesta and its platform-sharing Polo cousin, the new Ibiza is just plain bigger than before. Crucially, though, it doesn’t feel too big. Rear passengers get more room and the Ibiza’s usefulness for an Ikea trip has been increased (trust me, I performed miracles to cram flat-packs into my old one), but it still feels and drives like a small car. It’s nimble and the handling makes for an engaging drive, and it’s a perfect size for nipping round south London’s congested streets, while feeling more composed than ever on motorways. Complaints? I have a few niggles, which may grow into annoyances in the coming months. The ride, with MacPherson front struts and a semi-rigid rear axle, can prove a touch jolting on bumpy city streets, although the trade-off is an engaging drive when you encounter faster, flowing roads. Also, the boot has a propensity for not closing properly; and twice I’ve had to stop driving to re-fasten it. And bafflingly, despite coming with a whole host of safety tech (enough to garner a five-star Euro NCAP rating) and having that lovely infotainment screen, on FR trim there isn’t a reversing camera. There isn’t even a reversing sensor, and while the Ibiza isn’t the hardest thing to manoeuvre (although it isn’t helped by small awkwardly shaped wing mirrors), it seems an odd omission in 2017. Even with those annoyances, I’m impressed so far. The new Ibiza feels more complete, more sophisticated than its predecessors – and, indeed, its rivals. Which, of course, is why we named it the best small car you can buy today. If Seat came of age with the Ateca, the Ibiza proves it is set to flourish. Time was you had to accept compromises on smaller, cheaper cars, yet the Ibiza is good to outstanding pretty much everywhere. If I was asked which supermini to buy today, I’d recommend this one. Some editing required I think! My Wife is driving a 2016 model, an FR 1.2 (110) and i have to say that it’s quite impressive, steers, accelerates, corners very well and is good on Petrol, but I have one nagging doubt, you see compared to the previous Ibiza she had I don’t think this one is as well screwed together. I dont get why you are surprised by the capability of this car to undertake long journeys, fit shopping in the boot and perform airport runs with luggage in the boot? Back in 2001 I had a mk4/5 fiesta 1.25, and drove from moray to devon, about 680 miles with my wife 2 children and luggage, it never missed a beat and we were perfectly comfortable so why you should be surprised at achieving this in a modern supermini that is as big as a mk1 leon, which you would have expected to carry out these tasks, seems strange to me. The modern supermini is more or less all the car you need due to its larger size extra kit and better performance. I'd be surprise if more people arent downsizing to them. The car is nice and amazing, it is hybrid as i think. Red is my favourite colour, i just love cars. The interior of the cars are so amazing.